Pepper’s Sports Cafe is located at 2510 University Drive South. It is an all-American sports bar, with a full menu full of burgers, appetizers, wings, ribs, daily food specials, and game day specials. As far as beverage menus they have a martini menu, a tea menu, and a weekend caesar bar which also includes a variety of vodkas. 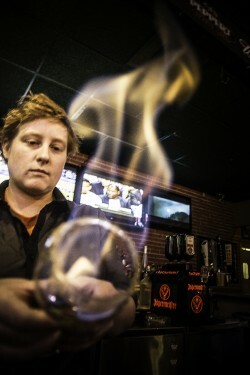 The Pepper’s Fireside Cafe is Pepper’s take on a Spanish Coffee. 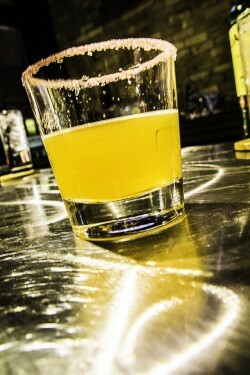 It starts with a cinnamon-sugared rim, then a shot of Bacardi 151 is set aflame to caramelize the sugar on the rim. 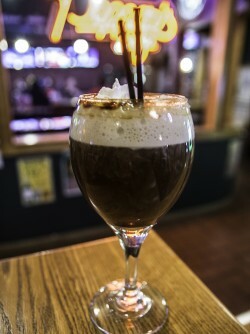 It also contains Kahlua, Cinna Sugar Twist Smirnoff, Triple Sec, coffee, and is then topped with whipped cream. The Alison Wonderland was inspired by Pepper’s Punch, which is their featured drink. It includes Smirnoff Vodka, Raspberry Pucker, pineapple juice, orange juice,a splash of 7up, and Bacardi 151-that’s the punch. The Hodo Lounge is located at 101 N Broadway at the Hotel Donaldson. The HoDo is known for using fresh, organic, and/or locally sourced ingredients--this doesn’t just stop with food preparation, it spills into some of their cocktails as well. They feature a lounge menu that exhibits a variety of fare, whether it be an entree, a plate to share, soups, or salads. 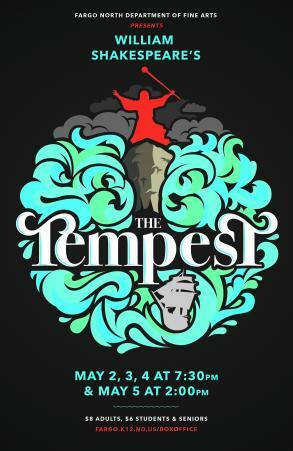 The atmosphere is wonderfully eclectic featuring the work of artists from throughout the region and spotlights the talents of regional musicians as well. 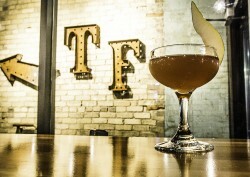 The Fall Smash contains Fernet’s Bitters which contain eucalyptus and anise flavors, lemon juice , Alander Rum, which is a rum distilled in Hallock Minnesota, but the most interesting ingredient is the apple pie shrub. It contains macerated apple, apple cider vinegar, cinnamon, sugar, clove, and took nearly two weeks to cure. 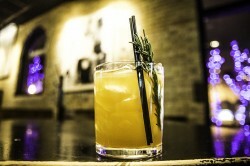 The cocktail is then sweetened with agave nectar and garnished with a sprig of rosemary. Pie cups is a seasonal shot. 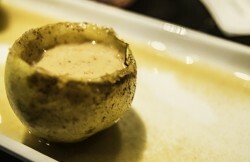 The “glass” is actually a hollowed out local pear, the guts were used to create a pear cider, the “shell” of the pear was then bruleed with burnt sugar. The shot contains housemade pear cider, Grey Goose pear, Alander Rum, and a dollop of housemade ice cream. According to Lewellan, there is a trend in which mixologists across the nation have been serving libations in edible vessels. 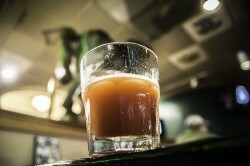 The Toasted Frog is located at 305 N Broadway. The menu has a wide range of selections whether it be soups, salads, sandwiches, wood fired pizzas, and appetizers. It also has a wonderful martini, spirits, beer and wine list. It also has a casual yet upscale atmosphere with it’s exposed brick interior and brushed aluminum bar. As if the title for the “Pear Amour” wasn’t exciting enough! It’s a play on the term paramour, which is an affair with an illicit lover. This cocktail contains The King’s Ginger (a ginger liqueur), a housemade infused pear brandy, Monin Almond syrup, allspice dram which is a highly aromatic rum based liqueur, verjus (for a little acidity), and orange blossom water. It is then served in a coupe’ glass and garnished with a slice of pear. “James and the giant peach” contains Jameson, orange juice, brown sugar, Monin almond syrup, peach bitters, and Peachcello. Why Jameson? “We’re in Fargo, and Jameson seems to pour from the streets of Fargo,” laughs luck. The shot was inspired by the popularity of Jameson and serves as a deliciously sweet and boozy allusion to Roald Dahl’s classic children’s novel.